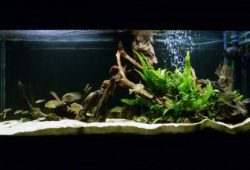 In the article it is spoken in detail about Invertebrates for Your Aquarium. 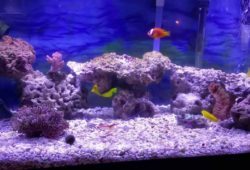 If you are setting up a saltwater aquarium, for instance a reef aquarium with a variety of tropical marine fish, you may wish to consider adding invertebrates to heighten interest in your tank. 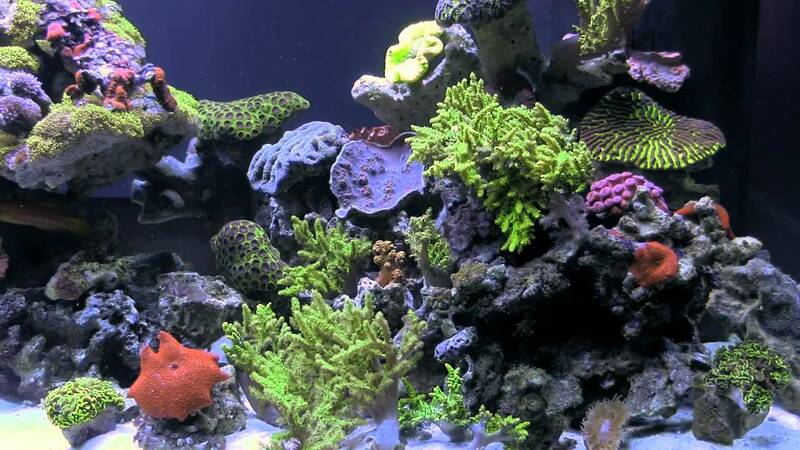 Marine aquariums are typically larger than freshwater aquariums and can accommodate a variety of life forms. Invertebrates might include shellfish such as clams, crabs, shrimp, and snails; anemones and cucumbers; sea stars and sea slugs; urchins and sponges; and much more. The selection is endless. Some crustaceans can perform an important function in your marine tank and act as “reef janitors,” consuming the debris that settles on your aquarium floor, eating algae, and sifting through the sand or gravel you have installed as a substrate layer in your tank. Some species of hermit crab feed on algae, including red slime algae, and sift through the sand. Be sure to check with your dealer, as other species of hermit crab can eat coral and other invertebrates you may wish to keep in your tank. “Good” hermit crabs include dwarf blue-leg hermit crabs and other dwarf varieties, electric blue and electric orange hermit crabs, Halloween hermit crabs, scarlet reef hermit crabs, and others. Also, various snails, which generally prefer settling on rocks and tank glass, will do a great job keeping these surfaces clean of algae. Chestnut cowries, margarita snails, nerite snails, turbo snails, and banded trochus snails are all herbivores and good varieties for tank cleaning purposes. A variety of shrimp also act as reef janitors, feeding not on algae but on small parasites as scavengers. Shrimp are best kept singly, or as mated pairs; if there are two males, or two females, they may fight with each other. Pacific cleaner shrimp and scarlet cleaner shrimp are popular reef tank additions; coral banded shrimp are also sought by reef aquarium owners, and are striking to look at. 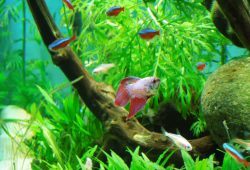 Make sure any shrimp you add to your tank is compatible with your other invertebrates and fish; some shrimp are said to attack certain fish, though often shrimp simply exhibit territorial behavior and chase off fish and other mobile creatures. And a harlequin shrimp, although stunning to look at, primarily eats the tube feet of starfish, so if you are keeping prized starfish, a harlequin would not be a good addition to your tank. Echinoderms include both starfish and sea urchins. There are thousands of varieties of starfish, including brittle stars, and many of these varieties can also act as scavengers. A “sand sifting starfish” is one variety that is active at night, sifting through sand and consuming unwanted detritus and leftovers that would otherwise decay. If there is insufficient scavenger food, you can supplement a sand sifter’s diet by dropping small pieces of food in the tank. Serpent stars are more aggressive; they have larger central discs and have been known to attack and consume gobies and other fish. Brittle stars, as the moniker suggests, are delicate creatures, also nocturnal. They hide among rocks during the day and come out to feed at night. Again, leftovers and other food debris are usually sufficient to feed a brittle star, without having to supplement its diet. Sea cucumbers, also echinoderms, are interesting creatures that resemble large slugs; they have thick, muscular bodies and tube feet that they use to cling to the substrate and move about. Sea cucumbers have fleshy projections called papillae that often cover their bodies. Some species are small, just a few inches in length, while larger species can be more than 3 feet in length and 1 foot in diameter — obviously too large for a reef tank! Holothuria and other families of sea cucumber suitable for reef tanks feed by mopping up particles of food on the substrate with their tentacles. Pay close attention to your sea cucumber, to ensure that there is enough for him to eat. It’s sometimes hard to tell if a sea cucumber is starving; if he begins to shrink, that’s a sure sign. Sea anemones are another classification of marine invertebrate which are largely stationary. A sea anemone is a polyp that attaches itself to the substrate or to a rock with an adhesive foot; once attached, they tend to stay in one place unless attacked. When introducing an anemone to a reef tank, the creature will usually find its own spot; however, be sure to monitor this process, to ensure that the anemone does not get caught up in any currents or stung by any coral that’s already in your tank. Anemones eat through a mouth that is surrounded by tentacles; since food must come to the anemone, your tank should have strong water flow. To ensure that your anemone gets sufficient food, you can feed him small pieces of shrimp, worms, or fish. These are usually expensive creatures to purchase, so take good care. Finding the right mix of invertebrates for your marine tank takes a fair amount of research, to create a community that is compatible and pleasing to observe. Some of these creatures are pricey, so you need to take special care to ensure that they are getting enough to eat. However, the end result will be a fascinating and educational ecosystem that will give you years of pleasure.